Simply send us via email to a high resolution HEAD SHOT photograph of your pet (full body pics will be cropped to a head shot) that has clarity and good lighting and we will hand sketch the image of your pet onto a 12 x 12" stretched canvas for you prior to the class! 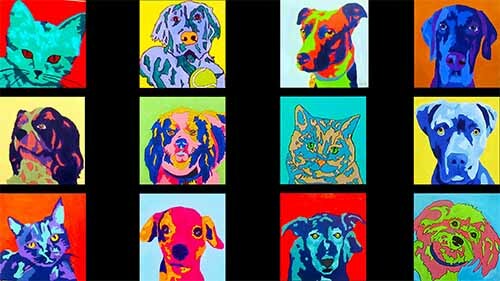 During the class, we will guide you through the step by step process of creating a colorul painted portrait of your pet! Please do know that the better the photograph, the better your drawing and painting will be! Background elements in your original photo will be eliminated all together. THIS CLASS IS FOR ONLY ONE PET. We will have an 8 x 10 picture of your pet for you to paint from.